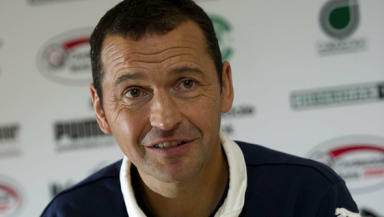 Hibernian manager Colin Calderwood believes he has the managerial know-how to beat Hearts in Sunday’s Edinburgh derby. Hibernian manager Colin Calderwood has shot down claims that he is too inexperienced to cope with the pressures of an Edinburgh Derby and claims his lengthy career in football management will hold him in good stead ahead of Sunday’s Easter Road showdown with city rivals Hearts. Despite featuring in several high-profile grudge matches as a player – including the North London derby with Tottenham Hotspur - newly appointed Hibs boss Calderwood has never experienced the cut-and-thrust of an Edinburgh derby. Across the capital opposite number Jim Jefferies has experienced the infamous city showdowns as both a manager and player, and has been involved in the Scottish game for over 40 years. Calderwood stressed that although he had the utmost respect for Jefferies record in the game he will have his own big-game experience to call upon come Sunday lunch-time. The former Northampton Town and Nottingham Forest manager said: “[Jefferies] is someone I’ve always looked up to, in terms of the job he has done for such a length of time. “There is no reason to be demeaning to anyone who has been in football that length of time and had the number of jobs he has had. As a former no-nonsense defender Calderwood is no stranger to getting stuck into a city rivalry, having played in both the big London and Birmingham derbies, the latter during a short spell at Aston Villa. However, Calderwood was cautious not to dreg up former glories and claims the focus should be solely on how his team perform in Sunday’s eagerly awaited league showdown. He added: “There is nothing from my experiences that the players want to hear about. This is the game this weekend. I’ve had my time as a player. After two straight losses, including a last-gasp 1-0 defeat to Dundee United last week, Hibernian find themselves in the unnerving position of 11th place in the SPL table, level on points with bottom place St. Mirren. It’s a slide Calderwood is keen to reverse, starting with a win in his first home game since joining the club in early October.